You know social media is the answer to your current or sudden marketing needs and you wish you could obtain some social media training from a reliable source. But first, let us find out why you need it and how you can implement it in your business. The power of social media is enormous, not just in reaching your exact target market, but also in exploring your reach and making the right business decisions. Five years ago, social media were restricted to a desktop browser, and now it is virtually everywhere what with the innumerous mobile applications to reach social networks and even more applications to extract specific functionalities. Did you know that Twitter has 300,000+ registered apps in the ecosystem? Or that the mobile broadband subscriptions are expected to hit the one billion mark by 2013? That is nearly one-sixth of the world’s population! Social media are redefining the world looking to internet and internet. If you wish to stay ahead in the race (or anywhere in it!) you need that social media training to make the most of the revolution. • The pros and cons of an idea: All the information is available on the internet. But do not forget that there are tons of it. If you think you can get to the bottom of Twitter, Facebook, YouTube or the hundreds of other media sharing platforms just by perusing online content, you cannot be more mistaken. There are zillion ideas out there as to how to best implement social media marketing strategies, and each has its pros and cons. A social media consultant is someone who has already measured the pros and cons for you. • Expand your trials, limit your errors: Success in social media is attached to experimentation. You cannot deduce what is the best strategy for your business just by reading an article on Mashable. Customized social media solutions for businesses can only be figured out through the regular trial and error methods. What your social media trainer or consultant do for you is to narrow down your relevant list of solutions. • Talk about perspective: Social media consulting & training can help you gain perspective on your social media strategy and provides you with reliable options—specific to your needs. If you are looking to sell jewelry online, you do not need a huge teenage following on twitter. Social Media Consulting will help you understand and reach out to the exact social media platform that your target market lies in. The best social media training will not give you a to-do list. Instead, it educates you in all the latest technologies and customizable solutions that benefit your social media strategy on a long-term basis. Kiran Voleti, one of the best Internet Marketers available today, is now consulting with corporates on their social media needs. 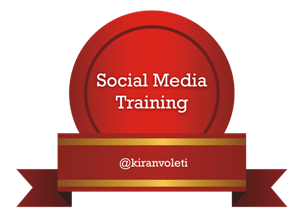 As a social media trainer, Kiran can provide for your business and your employees, the best solutions, and marketing strategies to suit your niche social media needs.